Got the pillows and they were everything I had hoped they'd be, semi-firm,and very cooling. I would recommend these pillows to those who are prone to hot or heat flashes, they really are cooling. I love these pillows! The memory foam creates that ahhh relaxing feeling when you rest your head and the gel keeps the pillows feeling cool throughout the night. No more having to wake and turn your pillow over to plump and find a cool spot. I also purchased the Arctic Sleep Cool Blue Gel Memory Foam Mattress Pad; the combination a great recipe for a good night sleep. Do Not Buy This Cool- Blue gel Memory foam Bed Pillow this was the worst buy ever, I was much smaller than I thought it would be and it did not stay cool at all I guess my temper was so hot from this very thin and hard memory just pillow it was so uncomfortable it gave me a neck and headache I was up most of the night; This pillow is a disappointment and I would not recommend giving this to anyone you like. Maybe this pillow provides cooling for the average person, but not nearly enough for this 58 year old post-menopausal woman whose body temp always seems to be in "furnace" range. That said, it is a fairly sturdy pillow, so 3 stars for that. I love these pillows! Firm enough for support but soft and comfortable from the memory foam, love them! I love this pillow. It is smaller than a standard, but I like that. I stayed cool, as claimed and no neck issues...a big plus! The only problem, finding a pillow cover and case to fit. May have to adapt a standard by cutting down ones I have and pulling out the dreaded sewing machine. No one seems to make the proper size I can order on line, or buy at a store, even in child's size! But, a great pillow, none the less! I Love my Arctic Sleep Cool Ble Gel Memory Foam Pillows..whether it is Summer or Winter..they are so comfortable and soft. Good thing I got two..otherwise my Hubby and I would be fighting over the one!! These pillows really are cool, even in the warmer weather but I don't remember memory foam being so "un-giving". They are a little harder than I wanted but still mostly comfortable. Love this memory form pillow! I'm defiantly buying more! These did not keep me cool, were very flat and hurt my neck. I need stability, these do not provide stability. I am returning. But in fact it's only one pillow. The pillow it's great very comfy and keeps cool. Probably wouldn't have bought it if I knew it's only one pillow but I wouldn't return it. It's super comfy. These pillows are okay. Pretty small. Not bad for the money. Just not what I was hoping for. I love this pillow!!!!!!! It's so comfortable and just the right size. I have spent hundreds of dollars trying to find the perfect pillow and this is it!! 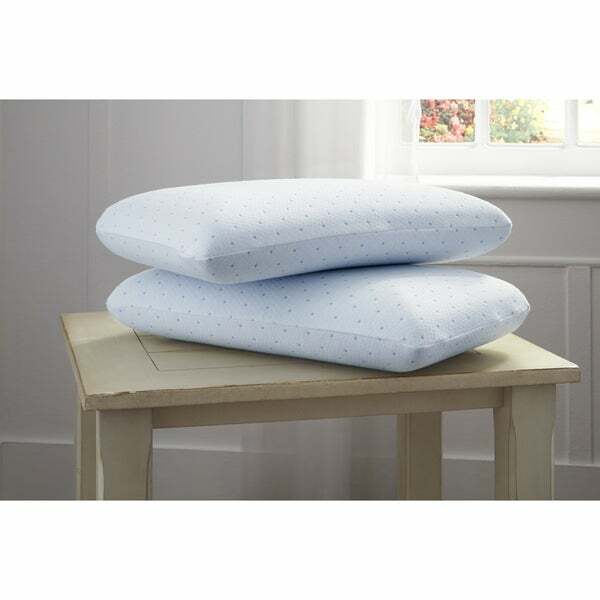 My son has a tendency to sweat when he sleeps, and it was that reason I decided to try these pillows. He received them this week , and is very satisfied with the coolness effect then offer him. Price and quality !!!!! Absolute must !!!! Very comfortable pillow! I have had it for a year now and it is still a great pillow. You have no need for two pillows as I have with other pillows in the past. Was not what I truly wanted or expected. Pillows are very flat and do not really have much cooling effect like the other cooling pillows I have used in the past (i.e. isoCool). Wouldn't buy these again. Very comfortable! I love how they mold to your neck and head. These are really great but they are quite thinner than I expected, thus why I only give 4 stars. I tried stacking them 2 at a time and its a little to tall to sleep on but otherwise they are fantastic and keep me cool thru the night! My first gel pillow. Worth the investment. "Is this one or two pillows?" A restful night sleep is very important to my husband and myself and those pillows have always been to expensive to try until now with you!